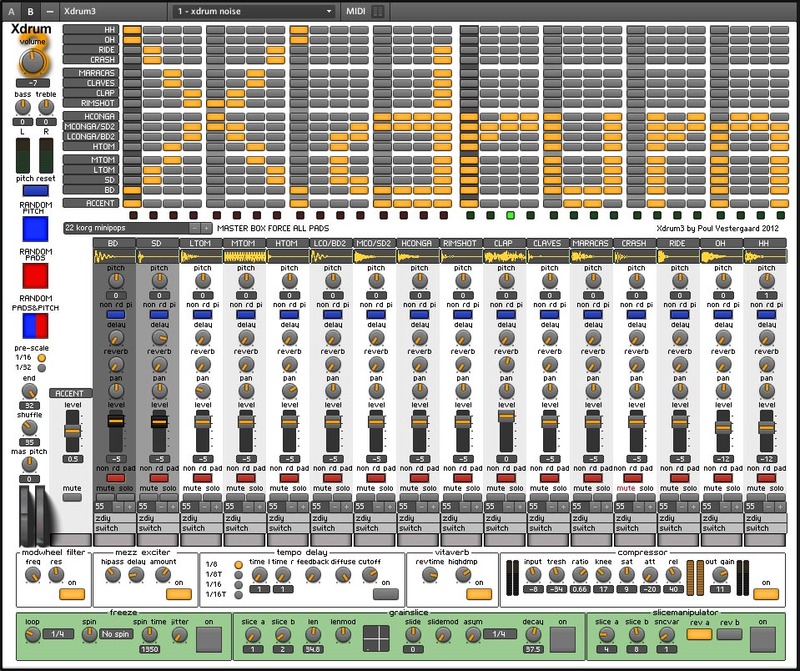 it has more than 870 audio samples (72MB) from 51 vintage rhythm composers, and then 13 aditional soundsets. Besides that it has more than 120 classic and electronica preset patterns. Enjoy... Poul Vestergaard, february 2012.
freeze effect on C3 / note60 / keyboard "Q"
grainslice effect on D3 / note62 / keyboard "W"
slice modulation effect on E3 / note64 / keyboard "E"
random pads (red buttom) change all pads random. but non randompad buttom can lock the pads. but non randompitch buttom can lock the pitch of each pad. the redblue buttome changes both at the same time.